Boost the efficiency of your support team by color coding queue titles and names in Jira Service Desk with the Color Queues app from Ascend Integrated. 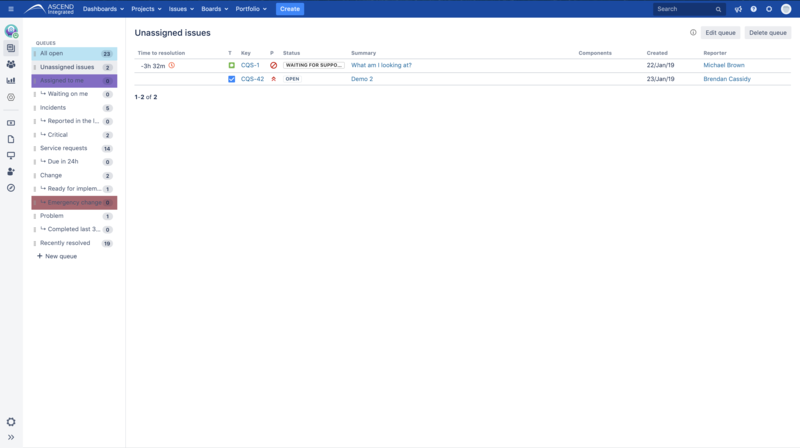 Ensuring your Service Desk team are focused on the most important issues, leading to improved performance and customer satisfaction is why we developed Color Queues Jira Service Desk App. The team here at Ascend Integrated welcomes you to install this free to use app today! Color coding queues in Jira Service Desk allows members of your team to identify queues quickly. For teams with an especially large amount of queues, color coding ensures specific queues are easily recognizable. The app allows you to create internal coloring conventions so that everyone on your team knows what queues they need to be working on and why. Managers and agents can now easily understand and separate queues based on their color. We understand that your organization has unique needs and requirements, that’s why we built color queues to be highly configurable to your specifications. You can color code queues using a custom color palette allowing them to visually represent factors like Assignee, Priority, or SLA Statues. Finding the right color for a specific task is always a great feeling. We give you a full-color palette so you can use any custom color you want within the Color Queues App. For teams with a large number of queues, network administrators can create queues for specific agents and assign them their own color to make finding tasks much easier. You want your team working on the highest priority tasks first. Color Queues allows you to color high priority queues so that team members know where to focus their efforts. Staying on top of your Service Level Agreements is key to any successful support team. Create SLA specific queues and color them to keep your organization aligned with SLAs. Need Help? Our team is here to support you, please visit our support help desk if you’re already a customer. Follow the link below read the full technical documentation and see exactly how the app works. Download the Color Cards app from Ascend Integrated for free and increase your efficiency by color-coding the cards.